The Verkhovna Rada Commissioner for Human Rights Liudmyla Denisova has published on her Facebook page three photos of political prisoner, Ukrainian film director Oleh Sentsov, kept in the Bely Medved (Polar Bear) penitentiary in Labytnangi, sent by the Russian side. 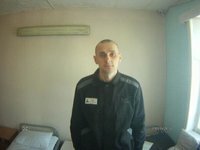 "I have just received Oleh Sentsov's photos from the Russian ombudswoman. According to the information that was sent to her, Oleh is active, he goes to watch TV, reads books, writes something from time to time. Everyone, I quote, wonder how he survives. His condition is satisfactory," Denisova said. The Ukrainian ombudswoman asked if she might publish the photo. She was told that they asked about permission to take a photo. "Oleh understands that people worry about him." Denisova noted that she had received three photographs of Sentsov. In turn, Sentsov's lawyer Dmitry Dinze shared this Denisova's post on Facebook and commented on it: "It's even worse in life, believe me."